I wonder how many good onions rot in landfills because of flaws on their outermost layer. Fumbled by a customer or split open by a box cutter, they join the forlorn cast of undesirables, like Charlie-in-the-Box on the Island of Misfit Toys. Of course, Charlie, Rudolph the Red-Nosed Reindeer, the caboose with square wheels and Dolly the rag doll, whose only flaw is sadness, don’t belong in exile. All they need is a loving child with imagination. And everybody knows that all an imperfect onion needs is touch-up work. Just peel down to a good layer. From there on it’s fit to join its soulmate, garlic, as the two aromatics chefs can’t live without. The onion, I can’t help noting, really is a wonder. It’s made out of rings for the sake of convenient battering and deep-frying. And have you ever noticed that onions participate in their own chopping? After a few knife strokes, they very considerately fall apart, thanks to those layers. Yes, onions can make you cry, but I’ve never met a cook who counts that against them. Why? Because the onion is a poet among vegetables. We foodies understand this. Okay, I think a lot about onions, but maybe you can forgive me. 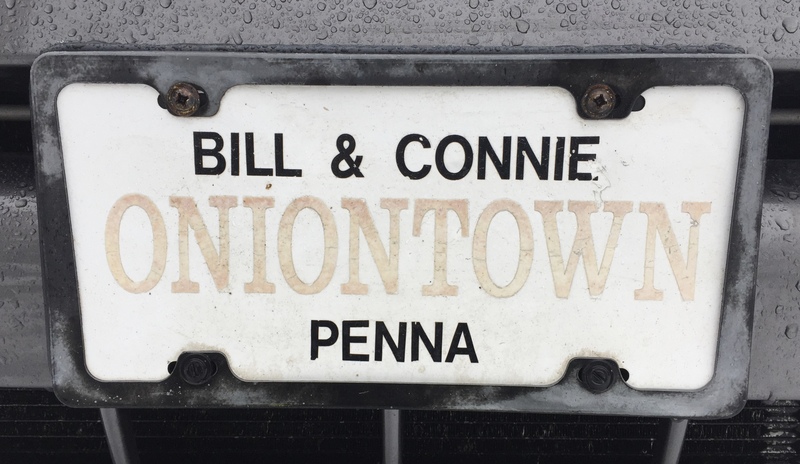 I not only work in the village of Oniontown, Pennsylvania, at St. John’s Lutheran Church, but also practically live in the kitchen. And if that weren’t enough, I’m a writer, a vocation that thrives on the inclination to think in layers. “O Onion! My Onion!” The commonplace observation that it consists of layers has been therapeutic lately for my uneasy soul. The skin of our 2017 world—the societal, national and international epidermis—is a torn, mushy mess. The old saying “going to hell in a hand basket” comes to mind. 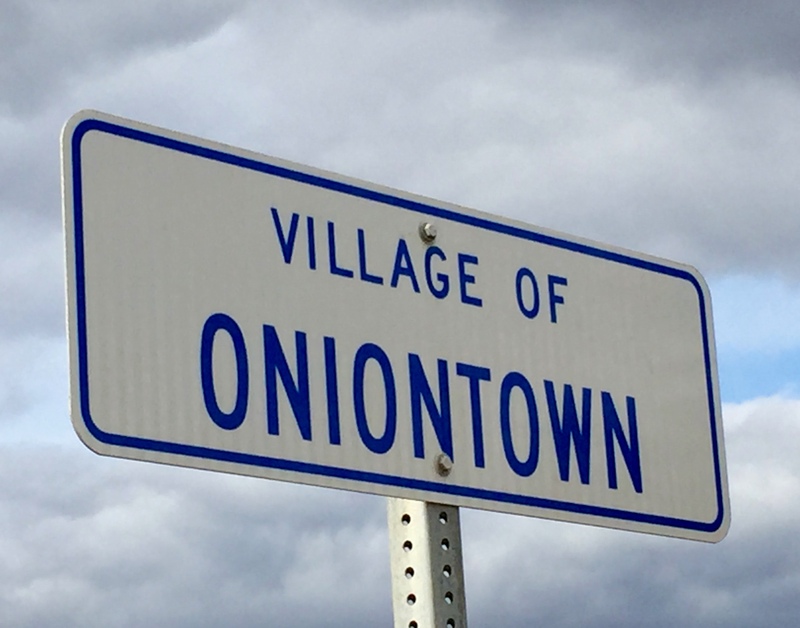 Seeing the village name, its proud letters larger than the others, felt like a grandfather’s encouraging pat on the back. Bill answered the door and led me to the bedroom, where Connie lay on her side with a blanket drawn up to her eyes. Her ponytail reached the middle of the neighboring pillow. Ailment upon ailment has rained upon her in recent years, and now two misbehaving vertebral discs have added thunder. Oh, dear! The onion is companion to garlic as back pain rivals the toothache for the most dreaded, non-life-threatening complaint. Connie was okay, provided she didn’t move. We talked for a few minutes, long enough for me to make her laugh. Nice going, Pastor. I said a prayer, soft but urgent. Relief can’t come soon enough. Options are running out. Pausing on our way to the backdoor, Bill leaned against a kitchen chair. His posture matched his hushed words: “I don’t know what we’re going to do.” We shook hands goodbye. “Onions.” Glancing back at that decorative plate, I held the word in my mouth. The blue marble speeding at 18.5 miles per second around the sun may not be watching, but in a warm house on Mercer Road, a man fusses over his wife, who endures with dignity. And people in warm houses in villages and cities everywhere quietly love and tend to each other. The onion—cliché that it may be—teaches me never to neglect the many layers below the surface, where anonymous multitudes dwell, overjoyed or getting by or out of rope. Down here, bane is always neck-and-neck with blessing. But hope lives down here, too, with Bill, Connie, Charlie-in-the-Box and all the rest of us who never make the evening news. There are even families waiting to cradle Dolly the rag doll and dry her tears. Only down here can you believe the onion’s greatest truth. Even in sorry shape, its theme is still promise. What appears, after all, when the onion’s weepy skin is pealed away? New life, bright, smooth, vulnerable with possibility.